LIVING ROOM of the Gregory Ain Exhibition House at MoMA. He was a proven and inveterate liar before he was elected to high office; Roy Cohn was his trusted advisor; and his fellow Republicans were loath to denounce him before he wreaked havoc on the country. Joseph McCarthy’s early 1950s reign of terror in the U.S. Senate zoomed straight to Los Angeles and swallowed Hollywood careers, destroyed families and friendships, and along the way subsumed a model house designed by the leftist Los Angeles architect, Gregory Ain, FAIA (1908-1988). 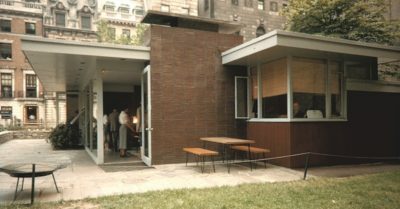 EXHIBITION HOUSE in the MoMA garden, with kitchen at right and open door into the living room from the patio; West 54th Street to the rear. Ain’s mid-century modernist model house was commissioned by the then-director of architecture and design at New York’s Museum of Modern Art (MoMA), Philip Johnson. The house was constructed in 1950 in the museum’s garden. It was the second of three houses that would be built — in a sort of design-for-living program — and then dismantled. Two are accounted for and were reconstituted elsewhere — but Ain’s has gone missing. Ain was under surveillance by the FBI. He reportedly was called “the most dangerous architect in America” by J. Edgar Hoover for the architect’s association with other “dangerous” types — left-leaning architects, writers, people of color, and homosexuals, all suspect then by definition. Frank Gehry, a student of Ain’s at USC after World War II, recalls (in an interview for the Getty Arts & Ideas podcast) that a group called the “Architectural Panel” met on Friday nights, with Ain and landscape architect Garrett Eckbo. “All the lefties belonged,” says Gehry, including himself. Sam Hall Kaplan, in his “Los Angeles Times” obituary of Ain, called him “a rare, humanistic architect,” who looked at design as a way to improve the lives of people and the health of communities. Ain and Eckbo designed a cooperative community for Reseda in 1948-49, envisioned as a multi-racial living environment. The Federal Housing Administration declined to finance it. It was a red flag, so to speak, for J. Edgar Hoover. It was placed in 2005 on the National Register of Historic Places. 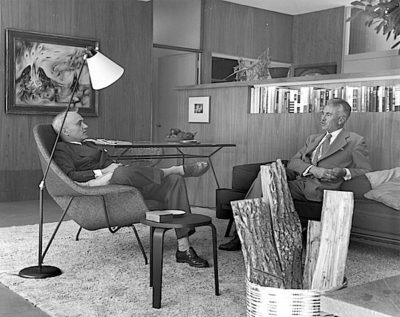 ARCHITECTS Philip Johnson, left, and Gregory Ain, right, in the living room of the Exhibition House designed by Ain. 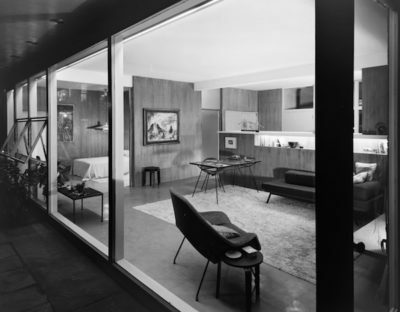 The best known of Ain’s and Eckbo’s community developments is the 1948 Mar Vista Tract, which was marketed as “Modernique Homes.” It became L.A.’s first modern HPOZ (historic preservation overlay zone) in 2002. She hired architect Dennis Gibbons for the remodel, and Larchmont’s own garden designer Judy Horton to redesign three small gardens. They worked from Julius Schulman’s 1930s photographs of the gardens — a bit of astonishing good fortune. But good fortune seems to elude an answer to the question of what happened to the Ain house that stood in the MoMA garden. 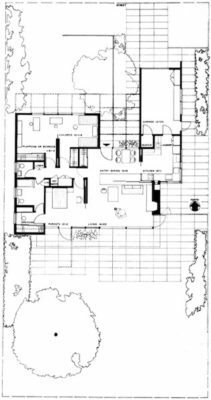 FLOOR PLAN of Gregory Ain Exhibition House at MoMA. Garden fence and West 54th Street are on the left side of the drawing. It is the question posed, but not answered, by a recent exhibit at New York City’s Center for Architecture (tinyurl.com/yaac5ojv) entitled “This Future Has a Past.” The exhibition was organized by Katherine Lambert, AIA, IIDA, and Christiane Robbins (a former Avenel Coop resident in Los Angeles). 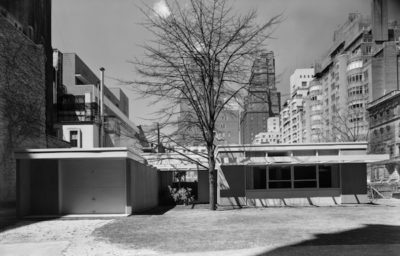 The two researchers followed leads that included Ain’s FBI file and the MoMA archives, neither of which gives any indication of what happened to the 1950 house once it was dismantled. According to the “New York Times,” Robbins is working on a documentary film about Ain, who left Los Angeles in 1963 to become dean of Penn State’s School of Architecture. But ill health and the aftermath of McCarthyism allegations plagued him, and he returned to Los Angeles in 1967, his career essentially over.